A fantastic goal which you can set yourself for 2019 would be to aim towards taking part in a competitive run. 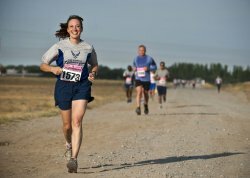 This is a great way to improve your fitness through the intense training required before the event and it is also a gateway to a healthier lifestyle. Running is the perfect way to improve your health through its numerous amounts of benefits to your physical and mental state. And whether you want to go at your own pace in a fun run or strive for a top spot in a marathon or beat your personal best, this is an excellent goal for 2019. During 2018 the 10K steps a day challenge was very popular and deservedly so as it is a fantastic way to keep fit. And this is why it is a great resolution goal for the New Year. Aiming toward walking 10K steps everyday can seem quite daunting at first, but when you get into a routine of walking more, you will notice the steps accumulate much easier. To keep track of your steps you can purchase a tracker to wear on your wrists from brands such as Fit Bit and Apple, but you can also make use of handy apps on your phone too. And by walking more you will find your mood and fitness levels increase as you are working your muscles regularly. 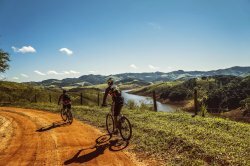 Whether you are an avid cyclist or just go out recreationally, discovering new routes could be a great way to spike your interest in the sport more. By planning new places to visit and ride, you will discover that you want to cycle more as the scenery around you will change every time along with the terrain. This is an excellent motivator as if you tend to stick to the same places; you do not feel like you are being challenged when you are riding your bike. If you are a regular commuter or those who prefer to cycle on the road, why not take a look at trying mountain biking to spice things up? If you aren’t the one for attending the gym for a workout, you may find that DVDs and phone apps are a great alternative. Therefore, when it comes to finding a new year’s resolution, you could look at trying a new online challenge such as the ‘30 day’ squats/push-ups applications. These can be downloaded onto your smart-phone where you can track your progress throughout the month. You can either choose to do 1 workout per month and switch it up, or alternatively you can do more than one activity and gradually increase their difficulty monthly. After this, you can feel an enhanced level of stamina and fitness from your latest commitment and as you can do this from the comfort of your own home, you will be likely to want to take part daily. There is nothing like the social motivation you get from creating a jogging group with your friends. This is a fantastic way for you all to increase your fitness levels together while having a catch-up. Or alternatively you can join your local jogging club and make new friends and explore pre-planned routes which you will find challenging. The great thing about jogging is that you can go at your own pace whether you are going it alone or as part of a group. Finding a Personal Trainer to help you with your goals when it comes to fitness is fantastic. They will be able to prepare food and training plans to assist you with whatever aspect of your body and health you would want to improve. And with this direction from a professional, you will be sure to see the results you want to compared to if you try to go it alone. If you really enjoy swimming, a new year’s resolution could be to attend your local swimming baths more regularly. Finding out the timetables of your nearest pool would be a fantastic start, and by incorporating this into your workout regime, you will reap the positive health benefits of the sport increasingly. Swimming works almost every muscle in your body when you are moving against the force of the water, therefore you will find that you will increase your muscle strength as well as improving your stamina and lose weight as a bonus too. Another goal you could set yourself for 2019 could be to improve your flexibility. This could be for personal satisfaction or benefit you more in another sport you already do such as dance. You can do this at home by following routines online or you can join in a stretching class at your local leisure centre. Increasing your flexibility is great for improving your muscle strength and when you start to see results you will reach a heightened level of satisfaction. Stretching can be done almost anywhere, even on your floor while you are watching TV, which makes it such an easy activity to incorporate into your daily routine. As mentioned previously, walking has a number of positive effects on your body, so why not introduce this activity to your whole family. Young children will love exploring their local environment during walks with their family, which will make it an enjoyable experience for all. You can look into local trails and even ones further afield for a change of scenery. Even if you just walk to your local shops or park and back regularly, this will also be beneficial to yours and your family’s health. Throughout this article we have taken a look at 10 fitness related goals which you can set yourself for the New Year. From discovering a new sport to improving your everyday routine, there is something for just about everyone discussed above. However, what we want to know is, what resolutions are you setting yourself for 2019? Get in touch with us over on our social media channels and share with us what you want to achieve in the coming year. To assist you with your new found fitness journey, you can take a look at our fantastic variety of sports clothing and accessories over on Sports Fitness which you can order imminently.